Fireworks & Afterparty at 11pm with more live music! Great music, bouncy castle, face-painting & more! Rabbit Hole Festival is a one day music event that promotes the talented musicians in Oxford. A family friendly event, the festival brings music, fun, drink & food to you in a relaxed style. Our thanks to our sponsors Freeths Solicitors, Riverford Home Delivery Oxfordshire, and 001 Taxis Oxford who have helped make the festival possible. With a delicious 12 course meal of Blues, Latino, Brass Funk, Americana, Folk, Acoustic pop, Jazz, and Celtic. It's going to be a great day! See the timetable. General admission (ages 16+) tickets are £8.50 on the door and early bird tickets are £7.50. Tickets are £7.00 for ages 13 - 15, and free for children aged 12 or under. You can buy tickets online but to get an early bird ticket you need to go the The Victoria Arms or Hair By Mark Dancer. Tickets will also be available on the door - Cash only on the door, thank you. General Admission (Ages 16+) £8.50 Available on the door and online (booking fees apply). Early Bird (Ages 16+) £7.50 Available from The Victoria Arms in Old Marston or from Hair By Mark Dancer. Ages 13 - 15 £7.00 Available on the door and online (booking fees apply). 12 & under Free No ticket needed. On entry you will receive a festival wrist band. Gates open at midday. Music on the main stage will finish at 10:30pm, followed by fireworks and an after party with Mad Marston Hares. Spirited Second Line Revelry, Galloping Gypsy Czárdas, Pumping Brass Driven Funk! The Brass Funkeys are an 8-piece London-based Brass Band who draw on the traditions of New Orleans. Formed in 2011, they have played at major festivals including Glastonbury, Wilderness, and put on an eclectic live show bursting at the seams with ideas and infectious energy. "Brass has not been this good since that time Reel Big Fish covered A-Ha…The Brass Funkeys are my favourite band." - 10/10 (Glastonbury review) Emma Garland, Editor VICEMAGAZINE: Noisey Music. A much loved and established Oxford band, The Shapes offer an immensely likeable mix of r'n'b, soulful pop, rock & roll, and new wave. Inspired bands such as Gold Rush, Stornoway and the Epstein, Ant Kelly returned to song writing and formed Shapes. The band have graced many stages since then, playing all over southern England, and get great responses to the live shows. This has included many festival appearances. Right now the band are writing and recording new material and gigging regularly. Featured on BBC Introducing, we introduce to you a five-piece indie-rock group from Oxford who are making waves! Lightspill's original songs bring heavy rock breakdowns, soft melodies, groovy baselines, and pop riffs with grungey overtones. Interested? They are headlining Rabbit Hole Festival 2018 for a reason! Winner of the Open Mic UK competition, Pheobe Rose is an 18 year old singer/songwriter from Oxford. With an incredible vocal range and a lovely touch on the piano, she will be preforming a mix of originals and covers. An amazing young talent who will go VERY far indeed. Check out her original song Blood, Sweat and Tears. This performance is NOT TO BE MISSED. We're excited to hear this quartet perform their versions of songs from the 50's and 60's, including pieces from Dave Brubeck, Miles Davis and Horis Silver. Sax & piano led, backed by bass and drums. Sadly, Ox Latin Combo have announced that they now are unable to play at Rabbit Hole Festival this year. BUT, the legendary Francisco Vera has worked tirelessly in the final week to try to find us a latin replacement, and we can now present to you Mambo Panthers, joined by infamous Sam Tusk, expert trombonist, and members from Ran Kan Kan & Ox Latin. Francisco Vera himself plays in Mambo Panthers, Ran Kan Kan, and has also helped out with The Oxford Beatles. Expect a versatile and eclectic mixture of Cuban son, Swing, Cumbia, Jazz, Rock, African rhythms and South American sounds. An experienced vocalist, singer-songwriter and vocal coach, Riaz will be performing a mixture of acoustic folk covers and originals. His delicate playing and beautiful heartfelt soulful voice knows no bounds. You may also know Riaz from the very successful and talented Oxford Beatles. Bluesy jazzy rock, poetic lyrics, and beautiful electric guitar solos from this new alt-indie band. Made up of 3 scientists and a poet, Full Circle will be performing easy listen music with a blues influence. A tag teamed performance by these two experienced singer songwriters. Cello folk trio fresh from East Oxford. Original folk from this experienced Oxford great. Bluesy rock, poetic lyrics & beautiful electric guitar solos. A sax/piano led quartet playing 50s/60s including Dave Brubeck & Miles Davis. Expect a versatile mix of Cuban son, Swing, Cumbia, and South American sounds. NOT TO BE MISSED! High energy 8-piece brass funk, influenced by jazz, reggae, hip-hop, gypsy & swing. NOT TO BE MISSED! A talented young star with an incredible vocal range performing a mix of covers & originals. A much loved Oxford band playing a mix of r'n'b, soulful pop, rock & roll, and new wave. A talented indie-rock group delivering soft melodies, rock breakdowns, groovy baselines, and catchy pop riffs with grungey overtones! Expect a mad celtic knees up! Situated on the banks of The River Thames, this year’s Rabbit Hole Festival will take place in the beautiful grounds of The Victoria Arms in Old Marston, Oxford. Oxford Bus Company X13 or 13 runs every 10 minutes between Oxford City Centre and Abingdon, stopping in Marston. The 14A is far less frequent but also runs through Marston via the City Centre and the JR hospital. It’s then just a short walk (10 minute) from the bus stop. The pub is tucked away by the river, set back from the village, so it makes a pleasant walk. Take the footpath from the back of Oxford University Parks, or from Marston Ferry Road. Alternatively, you can simply enter via Mill Lane. Hire a punt for the day from The Cherwell Boat House and punt to the festival. The easiest way to get to The Victoria Arms is via the A40 ring road. If you are coming from the Headington and the ‘hamburger’ roundabout, join the A40 to head west towards Summertown and North Oxford. After two miles, take the side turning off the A40, signed posted to Old Marston. If you are coming from the A34 (North West Oxford) take the A40 towards Headington and East Oxford. After about 2 -3 miles, take a side turning off the A40 ring road, sign posted Old Marston. The Victoria Arms in Old Marston is situated in between the John Radcliffe Hospital and Summertown. If you’re in Oxford and coming by car you will want to head towards Summertown/JR Hospital direction, but check your map to see how to get to Old Marston - OX3 0QA. It is now possible to park in the orchard (the grassy area next to the main pub car park). However, we still expect parking to be very limited so we strongly recommend parking on the main road - see details below. Parking is available on the road past the pub entrance - this road is a dead end, there is plenty of room for parking (picture below). As you approach the turning to the The Victoria Arms, you will be on Mill Lane - DRIVE PAST the entrance and park on the road where you start seeing fields either side. The road eventually becomes a dead end. Note: no parking is permitted anywhere on the lane down to the pub. The lane down to the Victoria Arms must be kept clear AT ALL TIMES - this is so that emergency services can gain access if needed. Please do not park on the small road down to the the pub as this will need to be kept clear for emergency vehicles. No parking is permitted on this lane. The Victoria Arms will have it's bouncy castle up all day, and face painting at set times. The Victoria Arms will be providing their usual menu plus a burger hut, a hog roast, and Caribbean street food. The Victoria Arms offers a large range of beverages including ale on tap and a wide selection of gins. Check their website for details. A bouncy castle and face painting will be on-site all day. The landlady Ruthie will be providing additional toilets to minimise queuing. Please go to our parking section for information on parking. We are so pleased to be able to run Rabbit Hole Festival again this year, but it wouldn’t be possible without our sponsors Freeths Solicitors, Riverford Organic Home Delivery, and 001 Taxis. Freeths LLP is proud to be the legal sponsor of the 2016 Rabbit Hole Festival. We a leading law firm with a national reputation for handling commercial and personal matters for a wide range of individuals, businesses, institutions, and third sector organisations. Our clients face complex challenges in various environments and they come to us because they need lawyers that have the experience and expertise to solve problems quickly and successfully. Visit our Freeths website to find out how we can help you. Now in our 50th year, 001 are absolutely Oxford’s FAVOURITE taxi! We’re Oxford’s only “tech first”, “service first”, “fare last” Taxi company, with a fleet of 300+ Vehicles, ranging from Eco Friendly Hybrid’s, Executive Mercedes, to 8 Seater Mini buses. No matter where your journey takes you, 001 has you covered! Our state of the art Mobile App is like Uber for Oxford but better! Users can order a taxi, track its progress, and pay by card, cash, or on account, or users can you the same service online via our Web booker software on our website. We regularly support Festivals of all sizes in the Oxfordshire area, and this year we are very proud to be working with the Rabbit Hole Festival. Rabbit Hole Music Festival will take place again this year in the beautiful grounds of The Victoria Arms in Old Marston, Oxford. 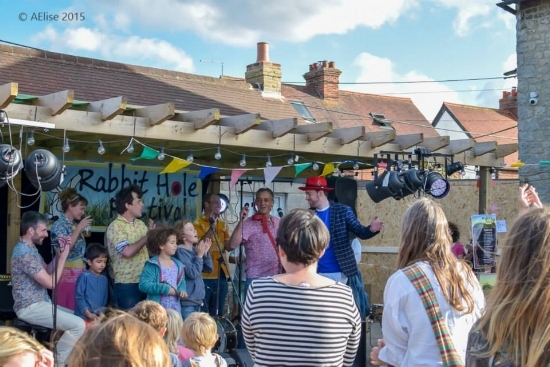 Set on the banks of the River Thames, Rabbit Hole Festival delivers a day of live music in a relaxed family-friendly style. Music is a passion of the festival’s founder, Ed Reckitt, and is the beating heart of the festival. But, it’s how it’s delivered that makes it so special! Ed welcomes all to the festival and strives to have a low ticket price so money is not a factor for those who attend. Back in 2014, Ed held a garden party as a private event. It consisted of one stage and all 6 bands agreed to play for a jacket potato from the BBQ. Ed expected around 30 guests, but it was easily double this number enjoying the festivities. One year later Ed, with help from his friend Karl, held the event at the much larger premises of The General Eliott pub in South Hinksey, Oxford. At a personal cost of £4,000 to Ed and Karl, it was marketed as a free event and counted close to 900 visitors on the day. “Trying to get funds is difficult, but I’m really pleased we’ve managed to secure sponsorship to help with the costs”. The story of how this festival came about, and the personal passion and determination to make it what it is now, is truly inspiring. Ed firmly believes there are many amazing acts on our doorstep here in Oxford, but recognises that not everyone has the opportunity to see these artists who often gig on week nights. “I feel proud to be able to showcase talented acts in Oxfordshire, and in particular provide a stage for those young up and coming performers”, Ed says. “I’m keen to curate a line-up that is both varied and accessible” said the founder. Inspired by WOMAD festival, Ed aspires to have as many different genres as possible in his one day event, including blues, rock, folk, latino, country, celtic, and jazz. The 30 – 45 minute sets keeps things interesting. Rabbit Hole Festival is keen to promote the performers as much as possible, the festival website has bios of all the artists including music videos. Can’t do It without YOU! It is, of course, not an easy task organising an event that needs to go up and down in a day, has 10+ acts and 350+ people attending. However, the founder says it’s the musicians and those who attend that make the festival what it is. “It would be nothing without the people of Oxford”, he says. “I am grateful to everyone who comes, and I’m pleased they enjoy it so much. Making it accessible to all, including families, is important to me. A lot of thought goes into selecting the right bands to ensure the quality of music is high, but it's not just about the music. We are serious about what we do and delivering the best experience”. The festival will have a bouncy castle and face-painting this year, and will will also repeat the amazing firework finale like last year. Oxford’s Rabbit Hole Festival 2018 wouldn’t be possible without the support of local businesses Freeths Solicitors, Riverford Organic Home Delivery, and 001 Taxis. Strong vocals, bluesy riffs, and a ‘not to be missed’ performance by rock ‘n’ roll band. High energy feel good funk from these experienced musicians. Danceable feel-good reggae vibes with smooth female vocals from Zaia. Lucy's song writing combines aspects of contemporary acoustic-pop and jazz. Her first single of 2017, Midnight Car Ride, was released to critical acclaim and was 'track of the week' on BBC Introducing. This dynamic duo have a great vibe, great harmonies, and they sound, well.... a little bit country! Folk, county, blues, and pop covers from the very tight cover band The Wonder Rabbits. Latin vibes from this party band. A 35 strong choir deliver amazing arrangements of popular songs. StoryTeller, Little Red, Kastaphor, BMW, The Great Western Tears, Cigani Knees Up, Alphabet Backwards, Nick Higton, The Heavy Dexters, Matt Beesley, Papu Nui, Trev Willams, The Wonder Rabbits, Holly Redford Jones, and the after party provided by The Mad Marston Hares. The Epstein, Balloon Ascents, Great Western Tears, Matt Chanarin Band, Matt Winkworth, Illustrious Sambistas, The Howlin' Taildraggers, and The Wonder Rabbits.